Internet of Things and Patents: Towards The IoT Patent Wars? Intellectual property is a key, albeit overlooked, issue when it comes to the Internet of Things (IoT). It is still unclear, for instance, to what extent trade secrets can be used to prevent the user from controlling their own device (the so-called right to hack) and to hinder interoperability. Likewise, it is still to be fully explored to what extent intellectual property (database rights) can be used to prevent data portability. This paper focuses on patent law and, namely, on computer-implemented inventions by giving account of the approaches followed in Europe, United States, and India. With the IoT patenting activity being over eight times larger than the general worldwide increase in pat­enting, research on this field appears critical. The occasion of this study is the adoption in 2016 of the final version of the Indian guidelines on the examination of computer-related inventions, which have been surprisingly overlooked in the legal literature. The main idea is that the Internet of Things will lead to a dramatic increase of applications for soft­ware patents and if examiners, courts, and legislators will not be careful, there is the concrete risk of a surreptitious generalised grant of patents for computer programs as such (in Europe) and for abstract ideas (in the United States). The clarity provided by the Indian guidelines, following a lively public debate, can constitute good practices that Eu­rope, the United States, as well as the Republic of Turkey, should take into account.With the increase of IoT patents, it is foreseeable the shift from the smartphone wars to the IoT wars, as evidenced by some recent litigation between Fitbit and Jawbone. The (perhaps cold) war seems impending, due to a number of reasons, such as the complexity of the supply chain, the several domains in which the IoT is divided and the composite nature of the IoT devices. Aggarwal, V. (2015). India’s first Internet of Things policy to focus on Zero Defect, Zero Effect. The Economic Times India. Retrieved from arti-cles.economictimes.indiatimes.com/2015-04-10/ news/61017670_1_iot-m-sips-draft-policy. Amundson, S. (2016). United States: Pat¬ent Disputes Over Wearables May Herald Broader¬Patent Litigation Regarding The Internet Of Things. Mondaq Business Briefing (4 April). Beardwood, J. & Bowman, M. (2016). The in¬ternet of things and privacy: when do privacy laws apply? Comps. & Law, 26(Jun/Jul), 37-40. CEN and CENELEC (2016). Standard Essential Patents and Fair, Reasonable and Non-Discriminato¬ry (FRAND) Commitments (CEN-CENELEC). Chathurvedula, S. (2015). Revised guidelines for software patents put on hold. Live Mint. Re¬trieved at www.livemint.com/Industry/XGBbgNll¬mvuEUhJWs2cWgK/Revised-guidelines-for-soft¬ware-patents-put-on-hold.html. Christie, A.F., Dent, C. & Liddicoat, J. (2016). The Examination Effect: A Comparison of the Out¬come of Patent Examination in the US, Europe and Australia, J. Marshall Rev. Intell. Prop. L., 16, 21. Comments and recommendations on the Guidelines for Examination of Computer-Related Inventions (CRIs) (2015). Retrieved at www.knowl¬edgecommons.in/wp-content/uploads/2015/11/ Comments-Recommendations-on-CRI-Guide¬lines-2015.pdf. Concerns over the “Guidelines for Examination of Computer Related Inventions (CRIs)” (2015). Re¬trieved at sflc.in/wp-content/uploads/2015/09/Let¬ter_CRIGuidelines2015-Prime-Minister.pdf. Consumers International (2016). Connection and Protection in the Digital Age. The Internet of Things and challenges for consumer protection. April 2016. Retrieved at http://www.consumersinter¬national.org/media/1657273/connection-and-pro¬tection-the-internet-of-things-and-challeng¬es-for-consumer-protection.pdf Crouch, D. (2016). First Amendment Finally Reaches Patent Law. Retrieved at http://patentlyo. com/patent/2016/10/amendment-finally-reaches. html. Davis, R. (2016). The Top Patent Cases of 2016: Midyear Report. Retrieved at http://www.law360. com/articles/812729/the-top-patent-cases-of-2016- midyear-report. Elvidge, J., Morrison, J. & Bijman, M. (2016). The IoT: A Look at the IP Landscape of Fitness Wear¬ables. IP Watchdog (24 August). European Patent Office. (2016). Guidelines for Examination in the European Patent Office, No¬vember 2016. Retrieved from http://www.epo.org/ law-practice/legal-texts/html/guidelines/e/index. htm. European Patent Office. (2013). Patents for soft¬ware? European law and practice. Retrieved from documents.epo.org/projects/babylon/eponet.nsf/0/ a0be115260b5ff71c125746d004c51a5/$FILE/pat¬ents_for_software_en.pdf. Goode, L. (2016). Fitbit wins big in trade rul¬ing vs. Jawbone. The Verge. Retrieved at http:// www.theverge.com/2016/4/29/11538454/fit¬bit-wins-trade-patent-ruling-vs-jawbone-ineligible. Greenberg, A. (2016). It’s Finally Legal to Hack Your Own Devices (Even Your Car). The Wired. Retrieved at https://www.wired.com/2016/10/ hacking-car-pacemaker-toaster-just-became-le¬gal/?mbid=nl_11116_p3&CNDID=32599349. Greenough, J. (2014). The ‘Internet of Things’ will be the world’s most massive device market and save companies billions of dollars. Business Insider UK (18 November). Ho, K. (2016a). United States: Internet Of Things: Another Industry Patent War? Mondaq Business Brief¬ing (5 January). Ho, K. (2016b). United States: 4 Things You Need To Know About The ImpendingInter¬net-Of-Things Patent Wars. Corporate Counsel (16 May) Ho, K. & Huang, H.-Y. (C.) (2016). Internet Of Things Patents: Tough To Enforce? IoT Central (7 November). Ho, K. & Johns, C.C. (2016). Patent the Inter¬net Of Things, or Not? TechBeacon (18 January). Ho, K. & Stein, J.D. (2016). 3 Challenges for In¬ternet-Of-Things Patents. Law360 (10 June). Horbal, P. (2015). Patents and the Internet of Things. Mondaq Business Briefing (29 July). Intellectual Property Magazine, Things just got interesting, I.P.M., Feb, 7-8. Intellectual Property Office (2014). Eight great technologies: The internet of things (UK Intellectual Property Office). Lee, E.A. (2006). Cyber-physical systems – Are computing foundations adequate? Position Paper for NSF Workshop on Cyber-Physical Systems: Research Motivation, Techniques and Roadmap. LexInnova (2016). Internet of Things. Patent Landscape Analysis (WIPO). Li, Y. (2016). Chinese Patent Office proposed revisions to its Examination Guidelines, 16 No¬vember 2016. Retrieved at http://trustinip.com/chi¬nese-patent-office-proposed-revisions-to-its-exam¬ination-guidelines/. Linkomies, L. (2015). Internet of Things mar¬ket develops fast but there are privacy concerns. P.L. & B.U.K.N.,79(May), 1,5-7. Lundqvist, B. (2016). Big Data, Open Data, Privacy Regulations, Intellectual Property and Com¬petition Law in an Internet of Things World. Faculty of Law, University of Stockholm Research Paper No. 1. Mar, E.Y & Liaw, W. (2016). IP Law December Developments: What to Expect in the Future. FBM (28 December). Miglani S. & Kumar, M. (2016). India’s bil¬lion-member biometric database raises privacyfears. Retrieved atwww.reuters.com/article/us-india-bi¬ometrics-idUSKCN0WI14E. Ministry of Electronics & Information Tech¬nology (2015). Draft Policy on Internet of Things. Retrieved at https://mygov.in/sites/default/files/ master_image/Revised-Draft-IoT-Policy-2.pdf. Ministry of Urban Development (2015), Smart cities. Statement and Guidelines. Modi, N., Prime Minister Narendra Modi’s speech on 68th Independence Day. Retrieved at http:// indianexpress.com/article/india/india-news-india/ pm-narendra-modis-speech-on-independence-day-2016-here-is-the-full-text/. Mohan, V. (2014). Ecologists cheer Modi’s ‘zero defect, zero effect’ slogan. The Times of In¬dia. Retrieved at timesofindia.indiatimes.com/ home/environment/developmental-issues/Ecolo¬gists-cheer-Modis-zero-defect-zero-effect-slogan/ articleshow/40312809.cms. Nightingale, A. (2016). More Rigorous Patent Examination in US Than Europe andAustralia?Intel¬lectual Property Watch, 2 November 2016. Nivarra, L. (2011). La proprietà europea tra controriforma e “rivoluzione passiva”. Europa e di¬ritto privato, 13(3), 575-624. Noto La Diega, G. (2017). Software patents and the Internet of Things in Europe, the United States, and India. European Intellectual Property Re¬view, 39(3), 173-184. Noto La Diega, G. (2016). Clouds of Things: Data Protection and Consumer Law at the Intersec¬tion of Cloud Computing and the Internet of Things in the United Kingdom. Journal of Law & Economic Regulation, 9(1), 69-93. Noto La Diega, G. & Walden, I. (2016). Con¬tracting for the ‘Internet of Things’: Looking into the Nest. European Journal of Law & Technology, II, 1-38. Office of the Controller General of Patents, Designs and Trade marks (2016). Guidelines for Ex¬amination of Computer Related Inventions (CRIs). Office of Controller General of Patents, De¬signs and Trademarks (2013). Draft Guidelines for Examination of Computer Related Inventions, June 2013. Office of Controller General of Patents, De¬signs & Trademarks (2011). Manual of Patent Office Practice and Procedure, v. 1.11. Roberts, J.J. (2016). Here’s Why Software Pat¬ents Are in Peril After the Intellectual Ventures Rul¬ing. Retrieved at http://fortune.com/2016/10/03/ software-patents/. Robinson, W.K. (2015). Patent Law Challenges for the Internet of Things. Wake Forest J. Bus. & In¬tell. Prop. L.,15(4) 655. Rose, K., Eldridge, S. & Chapin, L. (2015). An Overview Understanding the Issues and Challenges of a More Connected World (Internet Society). Sachs, R.R. (2015). Alice Haunted Federal Courts and USPTO in October. Retrieved at http:// www.law360.com/articles/724855. Trade Secrets Institute (2016). In the Matter of Certain Activity Tracking Devices, 337-963, U.S. International Trade Commission (Washington). Re¬trieved at http://tsi.brooklaw.edu/cases/matter-cer¬tain-activity-tracking-devices-337-963-us-inter¬national-trade-commission-washington. Trappey, A.J.C., Trappey, C.V., Govindarajan, U.H., Chuang, A.C. & Sun, J.J. (2016). A review of essential standards and patent landscapes for the In¬ternet of Things: A key enabler for Industry 4.0. Ad¬vanced Engineering Informatics. Weber, R.H. (2015). Internet of Things: privacy issues revisited. C.L.S. Rev., 31(5), 618-627. Wong, J.I. (2016). One company has a big edge in the fight to dominate the Internet of Things. QZ (23 May). Yeoh, P. (2017). The fourth industrial revolu¬tion: technological impact and privacy and data se¬curity issues. Bus. L.R., 38(1), 9-13. Zingales, N. (2015). Of Coffee Pods, Videog¬ames, and Missed Interoperability: Reflections for EU Governance of the Internet of Things. TILEC Discussion Paper No. 2015-026. Cases law Europe Judgment of the Court (Second Chamber) of 8 September 2016. GS Media BV v Sanoma Media Neth¬erlands BV and Others, C-160/15. EU:C:2016:644. EPO Boards of Appeal, T 1784/06 Classifi¬cation method/COMPTEL of 21 September 2012, EP:BA:2012:T178406.20120921. EPO Boards of Appeal T 0531/09 Check¬point simulation/ACCENTURE of 3 May 2012, EP:BA:2012:T053109.20120503. EPO Boards of Appeal, T 1265/09 Call center/IEX of 24 January 2012, EP:BA:2012:T126509.20120124. EPO Enlarged Boards of Appeal, G 3/08 Pro¬grams for computer of 12 May 2010, EP:BA:2010: G000308.20100512. EPO Boards of Appeal, T 1606/06 DNS determi¬nation of telephone number/HEWLETT-PACKARD of 17 July 2007, EP:BA:2007:T160606.20070717. EPO Boards of Appeal, T 1227/05 Schaltkreis¬simulation I/Infineon Technologies of 13 December 2006, EP:BA:2006:T122705.20061213. EPO Boards of Appeal, T 0424/03 Clipboard formats I/MICROSOFT of 23 February 2006, EP:BA:2006:T042403.20060223. EPO Boards of Appeal, T 0258/03 Auction meth¬od/HITACHI of 21 April 2004, EP:BA:2004:T025803. 20040421. EPO Boards of Appeal, T 0125/01 Gerä¬testeuerung/HENZE of 11 December 2002, EP:BA:2002:T012501.20021211. EPO Boards of Appeal, T 0641/00 Two identi¬ties/COMVIK of 26 September 2002, EP:BA:2002: T064100.20020926. EPO Boards of Appeal,T 1173/97 Com¬puter program product/IBM of 1 July 1998, EP:BA:1998:T117397.19980701. EPO Boards of Appeal, T 0190/94 of 26 Octo¬ber 1995, EP:BA:1995:T019094.19951026. EPO Boards of Appeal, T 0110/90 Ed¬itable document form of 15 April 1993, EP:BA:1993:T011090.19930415. EPO Boards of Appeal,T 0208/84 Comput¬er-related invention of 15 July 1986, EP:BA:1986: T020884.19860715. EPO Boards of Appeal, T 0163/85 Colour televi¬sion signal of 14 March 1989, EP:BA:1989:T016385. 19890314. EPO Boards of Appeal, T 0026/86 Röntgenein¬richtung of 21 May 1987, EP:BA:1987: T002686. 19870521. United States Thales Visionix, Inc. v. United States, No. 2015- 5150 (Fed. Circ. 2017). Fitbit, Inc. v Aliphcom, et al., No. 15-cv-04073- EJD (N.D. Cal. 2017). Amdocs (Israel) Ltd v Openet Telecom Inc, No. 2015-1180 (Fed. Circ. 2016). Cisco Systems, Inc. v. Arista Networks, Inc., No. 5:14-cv-05344-BLF (NC) (N.D. Cal. 2016). Fairwarning IP, LLC v. Iatric Sys, Inc., No. 15- 1985 (Fed. Cir. 2016). Synopsys v Mentor Graphics Corp, No. 2015- 1599(Fed. Cir. 2016). Affinity Labs, LLC v. Amazon.Com Inc. et al, No. 6:2015cv00029 - Document 75 (W.D. Tex. 2016). Intellectual Ventures I LLC v. Symantec Corp., No. 15-1769 (Fed. Cir. 2016). Micro, Inc. v. Bandai Namco Games Am., Inc., No. 15-1080 (Fed. Cir. 2016). Bascom Global Internet Services, Inc. v. AT&T Mobility LLC, No. 15-1763 (Fed. Cir. June 27, 2016). ENFISH, LLC v. Microsoft Corp., 822 F. 3d 1327 - Court of Appeals, Federal Circuit 2016. Jawbone v Fitbit (2016) unpublished. Electric Power Group, LLC v. Alstom S.A., 830 F.3d 1350 (Fed. Cir. 2016). Affinity Labs of Texas, LLC v. DIRECTV, LLC, 838 F.3d 1253 (Fed. Cir. 2016). DDR Holdings, LLC v. Hotels.com, L.P., 773 F.3d 1245 (Fed. Cir. 2014). Alice Corp. v. CLS Bank International, 573 U.S. __, 134 S. Ct. 2347 (2014). Association for Molecular Pathology v Myriad Genetics, No. 12-398 (569 U.S. ___ June 13, 2013). Accenture Global Servs. GmbH v Guidewire Software Inc 728 F.3d 1336 (Fed. Cir. 2013). Mayo v Prometheus, 132 S. Ct. 1289 (2012). Bilski v. Kappos, 561 U.S. 593 (2010). Diamond v. Diehr, 450 U.S. 175 (1981). Parker v Flook, 437 U. S. 584 (1978). O’Reilly v Morse, 56 U.S. (15 How.) (1853). ISNAD Noto La Diega, Guido . "Internet of Things and Patents: Towards The IoT Patent Wars?". 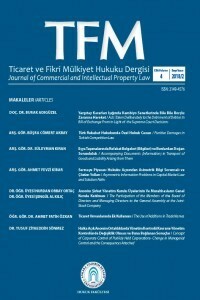 Ticaret ve Fikri Mülkiyet Hukuku Dergisi 3 / 2 (December 2017): 47-66.